Fun is just a flip and slide away! 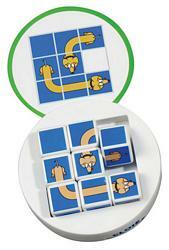 Select a challenge card, then flip and slide the special Flips dice to recreate the pattern. The perfect travel game, Flips is self-contained and fits in a purse, backpack or pocket. With three different levels of difficulty and 36 different patterns, Flips provides the perfect challenge for all ages.